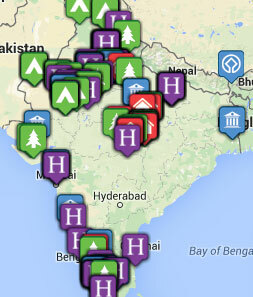 Tribes Overall: "The cycle trip to Tamil Nadu was an incredible experience. Very well organized. The Kerala boat trip was amazing. Lovely staff and food." Guides: "All very good and competent. Very willing to help." Social & Environmental Responsibility: "We are sure the local people benefited from our custom." Nice hotel. Comfy beds. A bit loud in the early morning when the ferry started operation. This was fantastic. The food was great. We were very comfortable on board. Two nights was definitely worth it. Excellent rooms-we shared a connecting door with our friends which was useful. The food was good, but the lunchtime menu had very few Indian options. We really had to ask the chef specially for authentic spices Keralan food. The grounds were beautiful and very peaceful at that time of year. The rooms were very comfortable, the staff were lovely, food excellent.